The Hanlon family from Doochary can no longer stand by and watch their son and brother in agony every day. 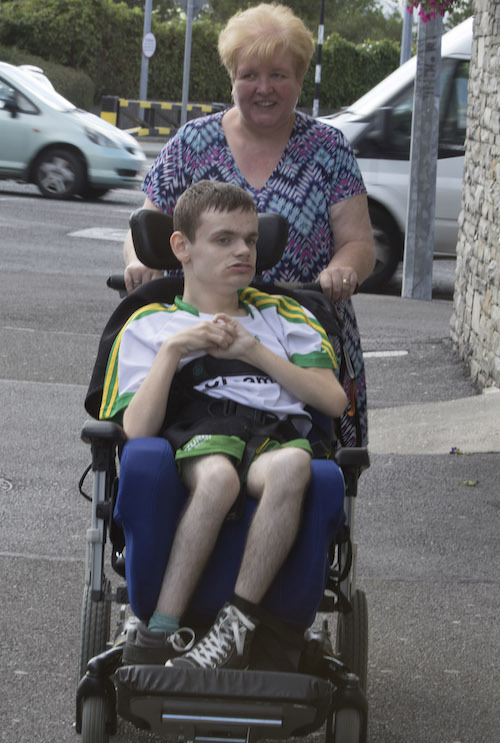 Liz Hanlon from Doochary has invited the Minister for Health to visit her ill son and see him screaming in pain as he awaits an operation to fix his spine. Jason Hanlon has always needed constant care since being born with health complications. But despite being in a wheelchair he has always been a happy and contented young man, according to his family. However, in recent years Jason, now aged 26, has developed scoliosis and is now in constant pain. Jason is on a list for a vital operation to fix the curvature of his spine at Tallaght Hospital. But that operation has now been put back on two occasions. And now his mother Liz fears he will not be operated on until next year as he cannot undergo a procedure during the winter months because of fears of infection. Liz said “Jason has had many challenges since birth but despite this, he has always been a happy and contented child and we always cared for him. “But the progression of scoliosis has turned his life into a living hell for himself and for all of us. “He is in constant pain and we are feeding him painkillers which is not doing him any good. His bowels are suffering as a result and I’m just not sure how long he can take this. Liz said she appreciates that there are other people on the waiting list for similar operations but she simply cannot stand by and watch her son suffer. She invited Health Minister Simon Harris to come to Donegal to see for himself the agony her son is going through on a daily basis. “If he could hear the screams of Jason then he might do something about it. Nobody should have to go through this. “He is in contact pain and to hear his cries day and night is just heartbreaking for us as a family. “Perhaps if the Minister heard his pain first-hand then it would prove to him how quickly Jason needs this operation,” she said. Jason is cared for by his loving family including sister Aine and brother Adrian, a former Donegal GAA star. Aine said to see her brother in constant pain is something she cannot take much longer. “To sit and watch my brother scream 24/7 with tears streaming down his wee face and not being able to explain to him what is happening to his own body is as you can imagine, heartbreaking. Hi, so sorry to hear about this. Heartbreaking I imagine. Just some advice, Would you try set up a go fund me account?where people can donate. Normally Irish people are really decent around these kind of issues and tend to raise the amount that’s needed. How Ye have a positive outcome.